Change can be difficult. But sometimes change is needed. 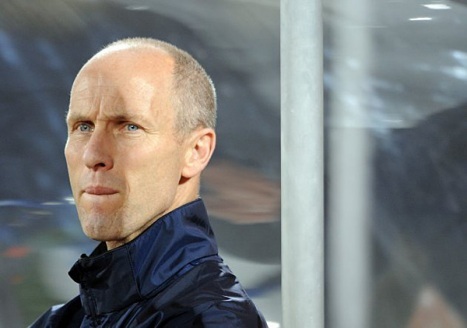 In the decision to keep Bob Bradley I was one in favor of change. This is not because of some ingrained Bob Bradley hate. I have defended him throughout the last World Cup cycle and think he would have done a good job at Aston Villa. Keeping Bob Bradley is no disaster and was likely the right decision for US soccer after US soccer likely failed to get Juergen Klinsmann for a second time. But the real question now is whether Bradley can move the team forward and take them to the next level. Our chief problem as a national team in my view, is that we have no third gear. We seem to have just two gears 1st or 5th. As we saw in the World Cup the US team would too frequently start like zombies in 1st gear but would kick it into 5th gear when their backs were against the world. But teams in a 90 minute game need a 3rd gear. They need to develop a way of playing that can be sustained over 90 minutes, that puts teams on the back foot through skill, guile, and possession, instead of sweat. To instill this new gear I felt the US men’s national team was in need of fresh eyes and of refining its style of play. And I am not sure Bradley is the man for that job. What looked to have happened here is both US soccer and Bob Bradley essentially broke up their marriage for a brief period and went looking for something better. Bradley was trying to throw his hat in the ring in England, first with Fulham than with Aston Villa. Sunil Gulati of US soccer examined what other possible candidates were out there and went back for Juergen Klinsmann. In the end, both these flings didn’t materialize. For US soccer the pursuit of Klinsmann again made sense. But it is likely that Klinsmann again wanted too much control over the direction of player development – a big issue in 2006 when Gulati went after him then. Perhaps that is both a small price to pay and something that is sorely needed. But I think in the eyes of Gulati, US soccer player development is already moving in a new direction and continues to produce better players and as a result better national teams. In other words, it ain’t broke. So handing over substantial control to a foreign coach who we know thinks the US development system is crap and that college athletics is no way to develop talent, could rock the boat so much that it capsizes. Furthermore, for US soccer there really aren’t that many great coaches out there. They all have jobs – except for Sven Goran Erickson. It is presumed that US soccer was the bad guy here that made poor Bob Bradley waiting. The timing of this seems to point to a different scenerio. I bet both US soccer and Bradley agreed that they would explore other options, while maintaining Bob’s contract. When US soccer and Bradley met last week that likely meant that Gulati had failed to get Klinsmann and then offered Bradley a new contract. Bradley thinking he had a real shot at Villa, said he wanted to see what would happen there. This weekend Villa effectively eliminated Bradley from contention, as it said it wanted someone who had Premier League experience. Hearing word on that it was likely Bradley who called Gulati – not the other way around. There were two fundamental reasons I was in favor of a new coach – namely Juergen Klinnsmann. First, I felt the team is in need of a stylistic and tactical make over. The US is need of updating its style of play. Over the last decade, the US has developed a counter-attacking approach toward taking on top teams and under Bradley has shown a gritty fighting spirit that we can be proud of as a country. But we have yet to have developed a true attacking style. And going forward the US will increasingly be unable to rely on an underdog status. Klinnsmann and Joakim Low transformed German team into a vibrant flowing attacking force. The US now has the players to emulate this to a certain degree. Under Bradley we saw flashes, but the approach has been the constant and outdated 4-4-2 – no matter if the US had the players to make this system work. When Charlie Davies went down, so should have the 4-4-2, but Bradley determined to have a speed striker play off Altidore brought on and started Robbie Findley in 3 world cup games. That was trying to stick a square peg through a round whole and exposed Bradley’s tactical rigidity. The 4-4-2 is now outdated in world football, the 4-2-3-1 is the formation that was most used and was most successful during the World Cup. The US has the personnel to implement this system but Bradley failed to recognize it. Finally the fact that the player pool is fairly settled made the US prime for a new system of play. We know what these players can do, it is about making them play better. This cycle is not so much about player development but about instilling an effective style of play. Second, the US needed a fresh look at the player pool. Sometimes teams and players need a fresh look. Things change over four years and players that once had it sometimes lose it. In the 2006 cycle, the US got stale. Players like John O’Brien made the World Cup squad based off performances four years before. Beasley played despite a lack of form. But this is not just about dropping players like Jonathan Bornstein and Robbie Findley, or figuring out which players should start, it is about figuring out where players should play and in what manner, should Donovan and Dempsey move up top? How do Jose Torres, Stuart Holden, Benny Feilhaber, Jermaine Jones, Maurice Edu, Ricardo Clark, and Michael Bradley fit into the side? With the seeming lack of true wingers do we play a more 4-3-3? Sometimes a new coach sees different attributes in players and can make these players more cohesive. Sometimes managers have a hard time letting go of players. For instance, for the US, the last World Cup should be the end of the road for Bocanegra. He is 31. He will be 35 in 2014. If Bocanegra was a World Class defender he no doubt would be kept, but he is not world class and will inevitably decline in four years. Meanwhile, the US has the opportunity to start a new. Will Bradley let Bocanegra go? His record of letting go of aging players isn’t bad, but this is the guy that was his captain. That is just one of the examples of the personal challenges facing Bradley. However, this is a safe, solid choice. We know the US will not suffer and epic collapse like Mexico did earlier this cycle. We know that the US will be competitive and will make the World Cup. We know that the team will fight and play with spirit. We know that there will be no drama in the locker room. We know we will have a shot at making a decent run in 2014. But we don’t know if we will actually be any better.